The Ancient Jordan Town of Jerash – Sand IS a Preservative! As part of our great Israel & Jordan visit, we stopped at the ancient city of Jerash, Jordan. In the interest of full disclosure, I did no research before our departure to Israel & Jordan. Typically I research a destination to death before we travel. Guidebooks are my friend – this trip, I did zero reading ahead of time. Our main motivation for traveling to Jordan was Petra. Period. I did not know what other historical sites were out there. Surprise. Historical Sites dot the Jordan map like places where Washington slept on the East Coast. All Over. Jerash is rumored to be the best preserved Roman ancient city in the world. Better preserved than Twinkies (are Twinkies still made or are we eating 15-year old pastries? – I forgot) – due to the sand that covered the site for years. Only recently (70 years or so…) has it been uncovered to reveal the beauty of the town. 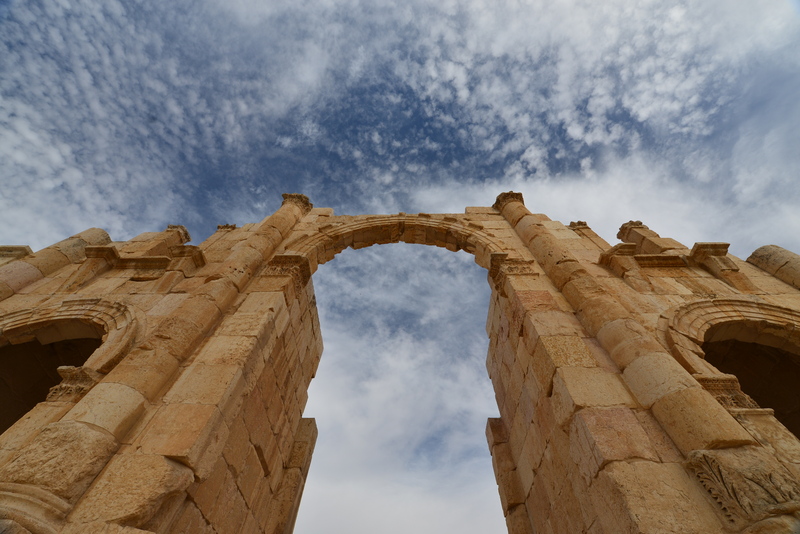 The town has an incredible entry way – the well-known Hadrian’s Arch – which greets visitors. And greeted Hadrian. Not to be confused with Hadrian’s Arch in Greece or Hadrian’s Arch in Italy. People really liked to greet Emperior Hadrian in style – this arch was built to say “Hello” in the Winter of 129–130. Built on the edge of town due to anticipated growth, which did not happen. Cobblestone paved street are everywhere in the ancient city and paved on the diagonal so wagon wheels would not get stuck when traveling down the streets. Those clever Romans. 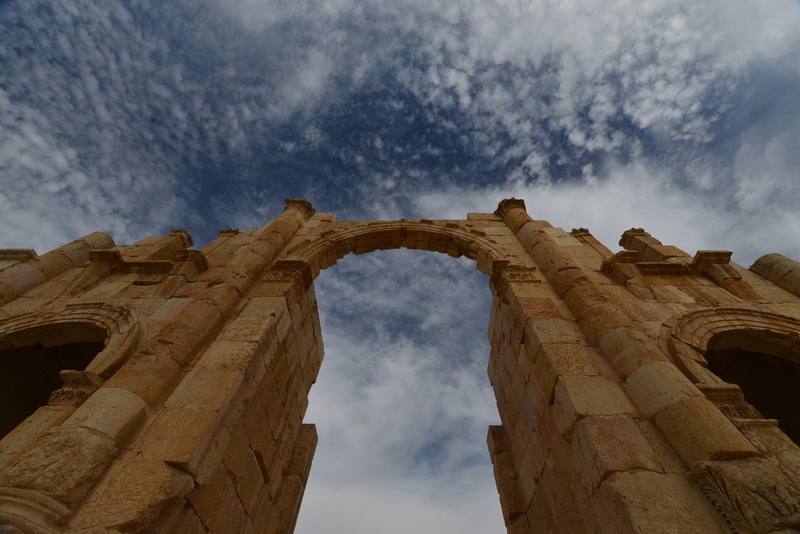 Here are some pictures that I hope you enjoy as much I enjoyed visiting and capturing the Jerash city sites. Those Romans really got around! Gail the pictures are great. The trip was fantastic even with a broken wrist involved. It was a pleasure traveling with you and Don. So many laughs. Hope to do it again some day. Thanks for sharing your pictures. HI Sharon – thanks very much for your nice note. Trust you both had a great Thanksgiving! That was my great pleasure to meet both of you, a lovely talented couple who knows to create a nature to be remarkable pictures that we would appreciated to share with those ” wonderful ” photos . I am so impressive what was I have seen. Please notify us whenever you have new posts.